Ld. Chandoys of Sudley summon'd to Parliament. p. Epus. Bathon. et Welien. p. Comes Oxon. Mag. Camerarius. p. Ds. Darcy de Chechy. p. Ds. Chandoys de Sudeleye. HODIE 2a vice lecta est Billa, for the Repeal of Two several Acts, made in the Time of King Edward the Sixth, touching the Dissolution of the Bishoprick of Durham. 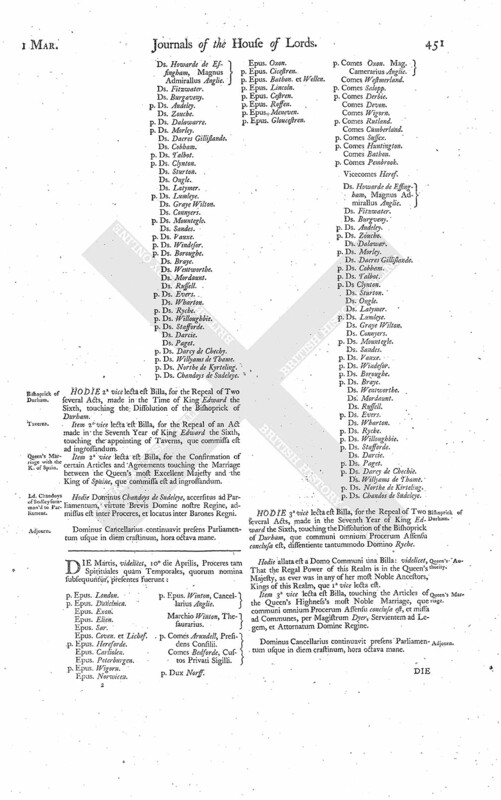 Item 2a vice lecta est Billa, for the Repeal of an Act made in the Seventh Year of King Edward the Sixth, touching the appointing of Taverns, que commissa est ad ingrossandum. 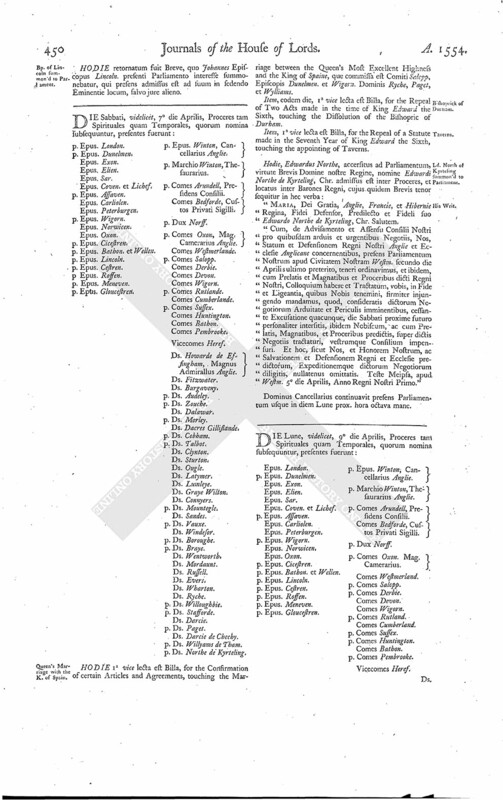 Item 2a vice lecta est Billa, for the Confirmation of certain Articles and Agreements touching the Marriage between the Queen's most Excellent Majesty and the King of Spaine, que commissa est ad ingrossandum. Hodie Dominus Chandoys de Sudeleye, accersitus ad Parliamentum, virtute Brevis Domine nostre Regine, admissus est inter Proceres, et locatus inter Barones Regni.